Some days on the railways were worse than others – in total, and for particular grades of workers. The 19th of January was one which fell into the ‘worse’ camp. Across the database as a whole, fifteen individuals were involved in accidents between 1911 and 1915. Nine of these were in 1911 alone, including seven split across just two cases which we’ll discuss in greater depth shortly. Before we do that, it’s worth mentioning how the accidents and cases were distributed, as this gives us some idea of accidents on a typical date in the calendar. So far as we know, there wasn’t anything particular exceptional about the date or the days involved over the five years that are covered by the database, so we have a helpful glimpse at an ordinary day – which probably makes those fifteen casualties more tragic. Six of the fifteen were fatalities on the permanent way, with another two workers killed whilst shunting; the remaining cases were injuries, three whilst working on the permanent way and four whilst handing goods. Of the five years covered, 1911 saw the greatest number of casualties on 19 January, concentrated on the permanent way grades: often the most dangerous, as well as the most likely to produce serious consequences if an accident happened. 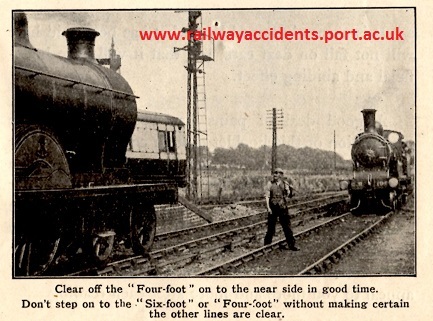 The day started badly: at 8am ‘surfacemen’ (the Caledonian Railway’s term for platelayers) William McBeth and Peter McLeish were at work slightly west of Blackford Station (near Auchterarder) when a train approach the line they were working on. They stepped back towards the other line ‘but failed to notice the simultaneous approach of the 6.25am passenger train from Dundee to Glasgow’. Both men were hit and killed. The Inspector investigating, JH Armytage, put the case down to a breach of rule 273(a), which specified that workers should clear the lines immediately as a train approached and should remain clear until all trains (including any that might have been obscured by the first train) were sufficiently far away that they could see they were not in any danger. Intriguingly, Armytage noted ‘a ploughman was endeavouring to control a somewhat restive horse in a field on the down side of the railway, and it is suggested that the surfacemen were watching the horse instead of paying attention to their own safety’ [1911 Quarter 1, Appendix B]. Inspector JPS Main investigated, and once again it was rule 273 (a) that had not been followed. Main concluded that there was plenty of safe space and ‘ample time’ for the men to get there, so ‘there was absolutely no reason for any of them to remain between the two lines or foul of them.’ The gang was experienced and knew the place and conditions well; ‘their attention has repeatedly been drawn to the terms of this Rule, and every effort appears to have been made by the Company to impress upon them the necessity of following the practice’ – no doubt, though not specified, via circulars and the rule book (hardly the most enticing of items!). Nowhere in Main’s report does he consider the possibility that the gang were under pressure to get their work down and so didn’t want to spend the extra time going across the tracks to the absolute safest point and back again – one of the harsh pressures that workers were increasingly under was that of time and ‘efficiency’. Main went on to say that ‘Sach had the reputation of being a careful man and he had on several occasions, I am informed, warned members of his gang against standing on adjacent lines during the passage of trains.’ However, Main then spend some time decrying the fact that the gang ‘appear to have been relying entirely on the look-out man.’ Baker’s conduct was criticised, though it was noted that ‘Baker had been acting as a look-out man for about a week, the regular look-out man being absent through illness.’ Main used the accident to call the companies to task, by suggesting greater professionalism in the selection of look-outs: ‘Men who have to perform this important duty should therefore be specially chosen; rules might be laid down for their guidance and they should be carefully examined as to their qualifications’ [1911 Quarter 1, Appendix B]. This issue did not disappear, and recurred well into the 1930s if not later. Rule 273(a) appears at least 32 times in the database, and of these instances 22 were fatalities. Sadly this wasn’t the end of the fatal day. Moving to Wales – death was no respecter of the boundaries of the home nations – and H Williams, permanent way labourer, was hit by a train and killed at around 12.30pm at Crumlin on the Great Western Railway. There was a heavy fog at the time, so Willams was on fog-signalling duties – that is, positioned to provide advance warning of the position of a signal, by placing detonators – small explosive charges – on the line, which would sound when a train ran over them. The guard of a passing mineral train noted a body on the tracks, and the presumption of JPS Main was that the train had hit Williams who had been attempting to cross the lines having set the detonators. Main made no comment about responsibility for the death, other than the oblique nod to the company in the comment that ‘the provision of a detonator-laying machine to enable the main line to be fog-signalled from outside of the up loop is required at this point, and I would recommend the Company to instal one as early as practicable’ [1911 Quarter 1, Appendix B]. Whether or not the GWR did so is unknown – the companies were not bound to follow the inspectors recommendations, which could not be enforced. Clearly this was a single day on which a large number of permanent way workers were either killed or injured, albeit in a relatively small number of cases. Track work was unusual, in that it sometimes involved large gangs of workers exposed to high levels of danger – meaning that when something when wrong, it had the potential to affect large numbers of people in one go, rather than the usual ones or twos who might be affected. Significantly, when workers were involved in accidents, given the nature of the work, the outcomes were frequently serious – certainly there are a large number of permanent way cases found in our project database.